All ranch meals are served with western cooking flair during regular hours in our centrally located dining room. Each table seats six to eight people. 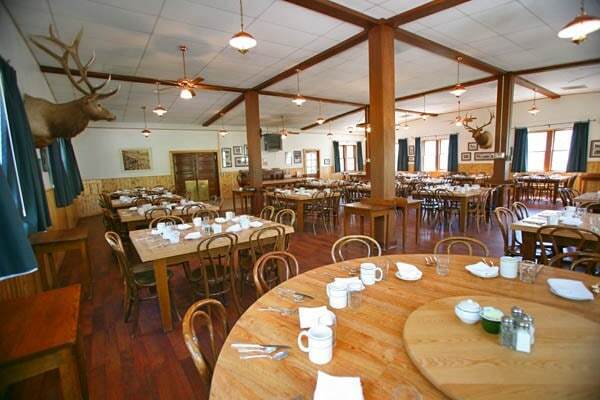 Our Wyoming dude ranch offers made-to-order breakfasts. Hearty ranch breakfasts are our specialty, but a selection of fruits, cereal and muffins are also available. Our lunch menu varies from buffets to barbecue cookouts. For dinner, we offer a choice of two entrees. We typically offer a choice between beef and chicken, fish or pasta. Saturday night at our Wyoming dude ranch is barbecue night by the creek. We will make every effort to accommodate special dietary needs, with advance notice, at our Wyoming dude ranch.